As we head into Thanksgiving week, I figured it's about time to share this post I've been meaning to write since last Thanksgiving. For as long as I can remember I've loved to bake, but only recently have I learned to love baking pies. I associate homemade pies with my grandma, who somehow managed to bake at least six pies every Thanksgiving and Christmas, in addition to cooking the rest of the meal. When I was a kid, she used to let me "help" by rolling up all her pie dough scraps into miniature cinnamon roll cookies. Up until a couple years ago, this was the extent of my pie baking expertise. I fell in love with the pie making process for myself when I discovered how creative I could get with the crust designs. Assembling my first lattice top took me back to the ceramics courses I took in college. Once I began to treat the crust like I would clay, decorating pies started to come naturally to me. Last fall, I ordered my first pie crust cutters, some fall leaves, and started experimenting with braids. I created this Pinterest board to gather inspiration. Now when I bake my pies, I feel like I'm preserving a tradition and keeping my grandma's memory alive. She would be so proud of my newly-acquired pie baking skills, especially my intricate crusts, which she definitely would not have had time for in her prime baking days. -Store-bought crusts: If you're short on time, of course you can use one. Besides convenience, they're usually easier to work with and result in less shrinkage. However, ever since I found my go-to crust recipe, I can't resist going the homemade route. -I use this pie crust recipe from my favorite food blog, Half Baked Harvest. It's an all-butter crust, with a mix of all-purpose flour and almond meal, and buttermilk instead of water. The flavor and texture of this homemade crust make an already good pie great. -Accomplished pie makers might freak out over this one, but there's really no need to chill your crust before you roll it out. Rather than struggling to roll out the chilled dough, I just roll out the crust to begin with and then refrigerate the whole pie for an hour before it goes in the oven. It still gets chilled, just at a different time. So much less stressful! -For optimal flakiness, do make sure your butter is chilled when you mix the dough together. -When it comes to rolling out the crust, if your dough is sticking to your rolling pin even with a sprinkle of flour, try rolling it between sheets of parchment paper. No stickiness and no mess! -Some pies require that you blind bake the crust, baking the bottom crust before pouring the filling in. This can cause major shrinkage. I've found better results by putting parchment paper over the crust and filling it with pie weights or dried beans when I bake it pre-filling. -Before I put a pie in the oven, I always brush the top with an egg wash (I use one whole egg, whisked with some water.) This gives the crust that shiny golden-brown look. 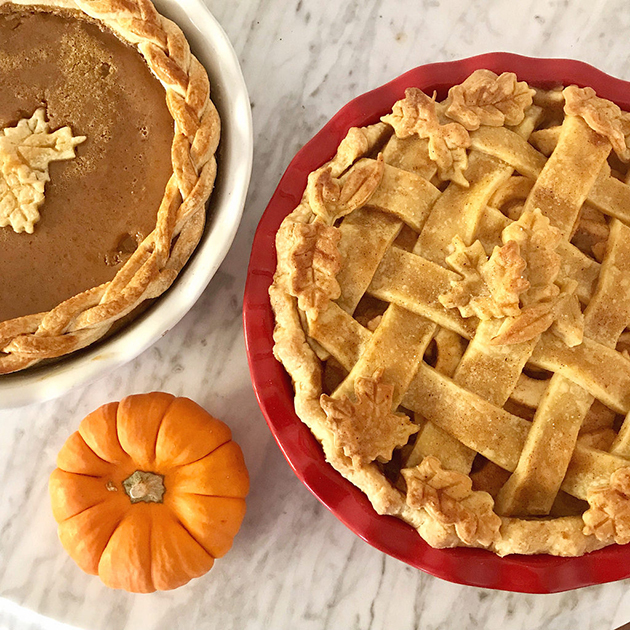 -Pumpkin: I may have upgraded my crust, but when it comes to pumpkin pie, I still love this classic recipe found on the back of Libby's pumpkin cans. In place of the evaporated milk, I substitute sweetened condensed milk, which makes the filling creamier and a little sweeter. Pour that filling in my homemade crust and you have the ultimate pumpkin pie! -Apple: For apple pie, this recipe is my new go-to. I found it on Pinterest and hesitated to make it at first because it has so much butter and sugar. But like most butter and sugar-filled recipes, it's totally delicious. It involves a caramel-like sauce that you mix into the filling and brush onto the crust. I like to use tart Granny Smith apples to balance out the sweetness. -This year, I'm on the hunt for a go-to pecan pie recipe. If you have a favorite, please leave the link in a comment! -Pie Plates: I swear by Emile Henry bakeware. Of course you can probably make a good pie in any old pie dish, but my Emile Henry ones absorb and distribute heat so evenly, guaranteeing a perfectly browned pie nearly every time. Plus they're pretty, and French! -Apple Peeler/Corer: For my apple pie, I use this old-fashioned apple peeler/corer to prep the apples. It's not essential, but it speeds up the prep-work and creates consistently-thin apple pieces that become so tender in the pie. 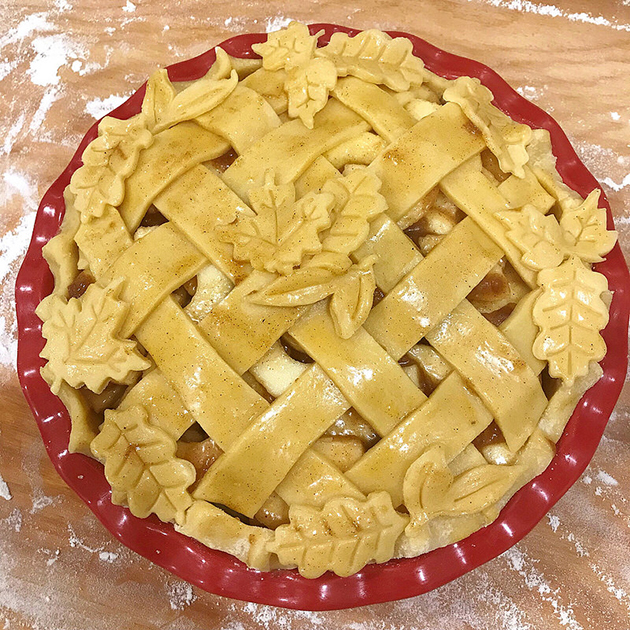 -Leaf Cutters: These leaf cutters make pretty fall pies easy, even for first-timers! I have these ones, and here's another set with great reviews. Please feel free to comment on this post with any questions or additional tips. And of course, send me pictures if you end up making a pretty pie of your own! Happy pie baking!